1. It is genuine leather. The leather is soft to the touch and feels so good. 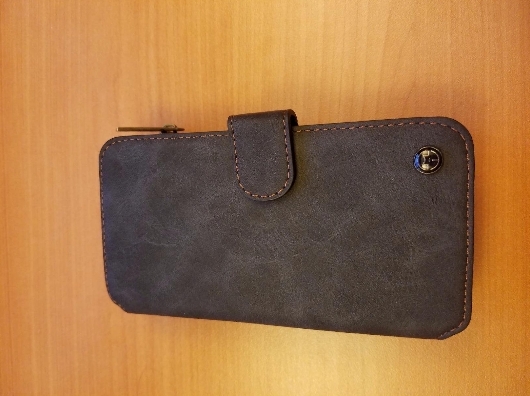 even the part that holds your phone separate from the wallet is backed by leather. It looks classy and every detail is meticulously attended to. 2. Every single closure on the case has a way to be secured. It sounds insignificant but its important, there is no portion of the case that can not be secured. The phone section is secured with magnets, the cash section with a zipper. One card section with a solid snap that my husband says he just loves, and the second card section is held by the same magnet that hold the phone section closed. 3. I love the stitching. It looks like someone took care when stitching the leather together and the contrast between the leather and the color of the stitching is perfect. Its not gaudy and looks classy as well. 1. I wish the card holders were a bit deeper. I do not like that my cards are hanging out of the holders quite as much as they are. This makes me worry that I will lose them. If it were not for the closure of the wallet portion I would feel less secure in the way the cards were being held. Overall my fears are probably overrated and this case is very sturdy. I love its textures, beauty and my husband thinks its great. I think it is well worth the buy.